Hydrochloric Acid Poisoning is the accidental or intentional intake of any product containing the compound. The exposure may be through skin or eye contact or following an ingestion of the chemical. What is Hydrochloric Acid Poisoning? What are the Causes of Hydrochloric Acid Poisoning? What are the Signs and Symptoms of Hydrochloric Acid Poisoning? How is First Aid administered for Hydrochloric Acid Poisoning? Who should administer First Aid for Hydrochloric Acid Poisoning? 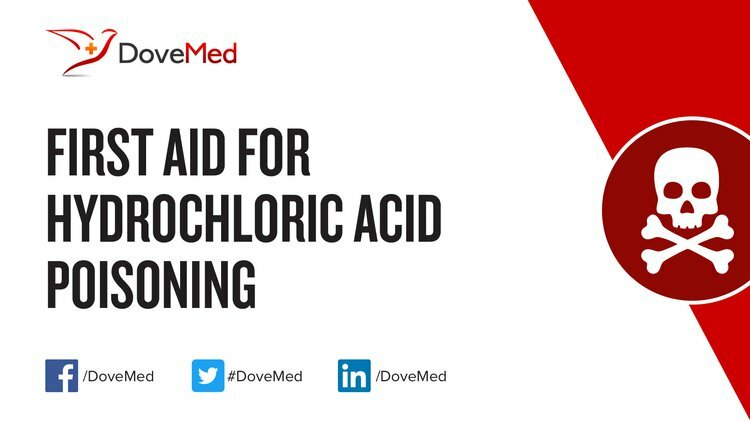 First aid for Hydrochloric Acid Poisoning is administered by healthcare professionals. What is the Prognosis of Hydrochloric Acid Poisoning? How can Hydrochloric Acid Poisoning be Prevented? Tanabe, K. (2012). Solid acids and bases: their catalytic properties. Elsevier. Brata Ghosh, V., Jhamb, U., Singhal, R., & Krishnan, R. (2013). Common childhood poisonings and their outcome in a tertiary care center in Delhi. The Indian Journal of Pediatrics, 80(6), 516-518. Burgher, F., Mathieu, L., Lati, E., Gasser, P., Peno-Mazzarino, L., Blomet, J., ... & Maibach, H. I. (2011). Experimental 70% hydrofluoric acid burns: histological observations in an established human skin explants ex vivo model. Cutaneous and ocular toxicology, 30(2), 100-107. Shrivastava, P., & Goel, A. (2010). Pre-hospital care in burn injury. Indian journal of plastic surgery: official publication of the Association of Plastic Surgeons of India, 43(Suppl), S15. Fujita, Y., Fujino, Y., Onodera, M., Kikuchi, S., Kikkawa, T., Inoue, Y., ... & Endo, S. (2011). A fatal case of acute hydrogen sulfide poisoning caused by hydrogen sulfide: hydroxocobalamin therapy for acute hydrogen sulfide poisoning. Journal of analytical toxicology, 35(2), 119-123. Pérez-Ramírez, J., Mondelli, C., Schmidt, T., Schlüter, O. F. K., Wolf, A., Mleczko, L., & Dreier, T. (2011). Sustainable chlorine recycling via catalysed HCl oxidation: from fundamentals to implementation. Energy & environmental science, 4(12), 4786-4799. Mowry, J. B., Spyker, D. A., Cantilena Jr, L. R., Bailey, J. E., & Ford, M. (2013). 2012 annual report of the american association of poison control centers’ national poison data system (NPDS): 30th annual report. Clinical toxicology, 51(10), 949-1229.